As consumers living in the 21st Century, we're hyper-aware of squandering resources. We turn off the lights when we leave a room, do our best to conserve water consumption and adjust the thermostat based on the daily outside temperature. We see these resources as vital to our everyday needs and want to make sure that we're using them properly so they don't go to waste. What many fail to recognize is that data is also a very valuable resource, in the way of evaluating and adjusting our daily strategies. But, more often than not, the data you have access to is completely going to waste. At LWS, we are big believers that evaluating and putting your data to work in business, results in informed and strategic decision making, which can lead to increased profits, productivity, performance and more. A real-life example of this is Uber's pricing strategy. They use data provided to them by their clients-- who are hailing rides digitally-- to determine hot-spot regions, high-frequency timing and resource allotment. In short, Uber adjusts their prices to the market conditions, as they change hour-to-hour, day-to-day. They're increasing their margins and thus, profits as the demand for their service goes up. While they are using data effectively, these cases are few and far between, as too often people see data as a way of keeping score as opposed to developing strategy. What does this mean? If you collect your data, review the information and make a statement like, "I got 50 leads from Source X", that's great-- but so what? Is it an increase or decrease over the previous month or year? Is that due to a change you made, are you running a new campaign or is that number consistent with seasonal trends? How much did you spend per lead, how were they distributed, how did your other lead sources perform? Not only reviewing the data, but analyzing it allows you to put everything in perspective and create a strategy for moving forward. Collecting data in the right way is a key factor in ensuring another valuable resource isn't wasted: time. It can be a time-consuming task if you have to sift through ambiguous data to get to the important elements. How do you get ambiguous data? Leading the user can cause these sort of data collections. If you ask the user 'how did you hear about us?' and then provide 5 options- likely the user is going to A) not answer honestly and will choose a random selection or B) Choose the option they feel closely matches their true answer -- in order to avoid the dreaded "Other" option where they have to fill in an alternate answer. Make sure you're asking the right questions, in the right way, so you don't overload your data collection. Lastly, when analyzing your data -- don't mine for the answers you want to find. As humans, we're great at recognizing patterns and predicting potential odds and outcomes. Sometimes though, we see patterns that aren't really there. For example, when players are at a roulette table and the ball has landed on 'red', 8 times in a row, people are more likely to bet on 'black', on the basis that 'it's due'. In reality, the ball landing on 'red' 8 times in a row has no bearing on what colour the ball lands on next. Data is not our native language and it is often hard to tell when a trend is meaningful or not without the proper tools and process. 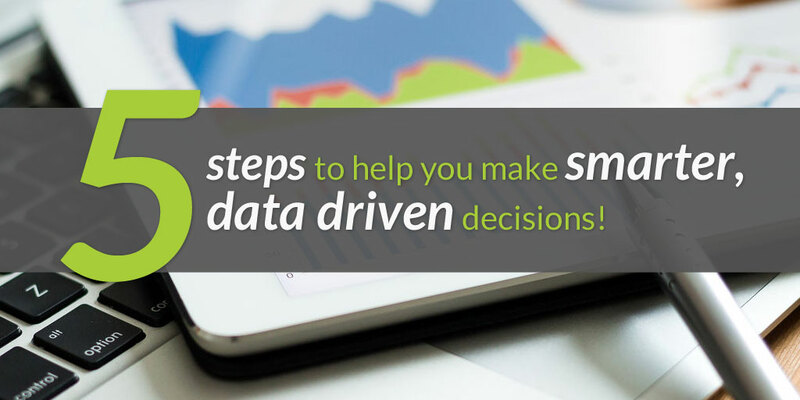 Here are 5 steps to help you make smarter, data driven decisions. 1) Collect - Determine what data you want to collect and setup the right forms & processes to do so. Ensure you have a good understanding of how and where your data is coming from. 2) Sort - Put the raw data into a more manageable source. Tools such as Excel's pivot tables have historically been a key way to organize data, though today programs like Tableau can help you visually organize that data and present it in an easier to view form. 3) Context - Review your data and determine what is useful information and what isn't. Take a look at your facts and figures and ask yourself 'why' and 'how' your decisions and strategies did or didn't work for you. Remember, there is a difference between seeing the data and utilizing it. 4) Action - Create decisions and strategies based around your data and implement them. If you feel the facts and figures you're working with don't show the 'whole picture', run a test case to collect additional sample data to confirm. 5) Feedback - While data gives input in a more black-and-white sense, you also need to take a look at how your decisions and strategies are affecting the 'real world'. Are your team members still efficient after a new strategy is put in place? Are your clients happy with the results or do they feel the process to reach you and/or your product or services is inconvenient? Make sure that while you're reviewing the data, you're also touching base with the people who it affects most.